Expats share their experiences with healthcare and expat health insurance in Sri Lanka. This is an excellent report about the specific health care conditions in Ngombo, Sri Lanka. Information about hospitals, medicines and the best health insurance is included. Giving birth in Sri Lanka was overall an extremely positive experience. I gave birth at Joeseph Fraser, an all maternity hospital in Colombo. It is the only one of its kind and is most likely where all expats are directed. The facility was fairly up to date although pretty lax sanitary conditions. When I first arrived I was put on a bed in a waiting area where a stray cat and her young litter were sleeping in the bed next to mine! By that time I had been in Sri Lanka for four years and it didn't phase me a bit - I was more worried about what was coming next. Because I had been in prelabor for three days I was induced with pitocin in an IV and I was given an epidural fairly early on. There was only one delivery room which is separate from the operating room where the epidural was administered. To get from one to the other I had to be wheeled on a gurney out through the main garden which was a bit unnerving although once the epidural kicked in it was sort of nice to be able to see the beautiful blue sky. I vaguely remember commenting about what a nice day it was (only on the way back mind you - on the way there I was doubled up in pain.) Also a note about epidurals - it seems they are fairly uncommon, at least when I was there. There is a lot of pressure on women, by their families, to not use them. Somehow you are not going through real childbirth if you go with the epidural. As an expat, I did not encounter that and my doctor was very neutral and left the decision entirely up to my husband and me. The labor lasted about six hours and the nurses were very professional and patient. We had also hired a Canadian doctor friend to serve as our doula. We had to clear this with our Sri Lankan doctor, but he was very accommodating. The only drawback was the fact that there was only one delivery room. It had two beds very close to each other and only a curtain in between. There was another woman in early labor in the next bed and I still feel sorry that she had to watch me deliver (and I didn't hold back) knowing what was next for her. They had only just recently changed hospital policy to allow husbands to be with their wife during delivery. The woman next to me only had her mother with her but I'm not sure how I would have felt having her husband in on my delivery. Hopefully they have added another delivery room by now. I was set to stay at the hospital for three days but only lasted about 24 hours after the birth. The rooms are not air conditioned and the matress on my bizarrely high bed (I needed a foot stool to climb up) was simply a thin foam pad covered in vinyl with a sheet draped on top. So, it was uncomfortable especially when I had an air conditioning and plenty of family help at home. Again the doctor was very accommodating and released me early. 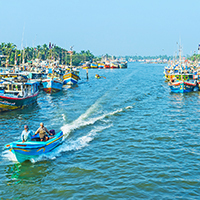 Help others moving to Sri Lanka by answering a set of questions about health insurance, public healthcare in Sri Lanka, prescription medicine, quality of medical care and emergency services. An expat mom in Sri Lanka talks about her experiences finding a doctor, at the hospital, during childbirth and more.